One of the most important aspects of English is idioms. They are frequently used in a wide variety of situations, from friendly conversations and business meetings to more formal and written contexts. An idiom is a group of words which has, as a whole, a different meaning from the meaning of its constituents (The Longman Pocket Dictionary: 2001). In other words, the meaning of the idiomatic expression is not the sum of the words taken individually. According to Redman’s theory (2002: halaman 40), “an idiom is a group of words with a meaning that is different from the individual words and often difficult to understand from the individual words”. 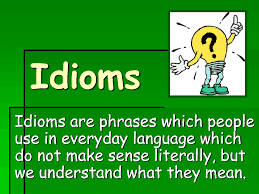 Abel (2003 halaman 329-358) defines idioms as phrases or sentences whose figurative meaning is not clear from the literal meaning of their individual constituents. Gillett, (2004 halaman 129) Idioms are a cluster of words or phrases that have a meaning of their own peculiar to that language. For example, we have said above that learning English with us will be a piece of cake - now, you cannot take the meaning of "a piece of cake" in the literal sense; you have to understand it in the idiomatic sense, in which it means "easy" an idiom is a kind of complex lexical item. It is a phrase whose meaning cannot be predicted from the meanings of the morphemes it comprises tically like a single word, it doesn’t function like one. A large number of idioms contain a verb and a noun, but although the verb may be placed in the past tense, the number of the noun can never be changed”, for instance, the expressions ‟kick the bucket‟ and „kicked the bucket‟ (someone who dies) are largely used in English, in contrast to „kick the buckets‟ which never occurs. Belum ada tanggapan untuk "THE DIFFICULTIES OF USING TRANSLATING IDIOMS ENGLISH-INDONESIA IN UNIVERSITY STUDENTS"